Barco was in Amsterdam this week for ISE touting its recently introduced G60 laser projectors for the professional A/V market, as well as introducing four new super-high-brightness entertainment projectors to its UDX Series. The encompases three single-chip, WUXGA (1920 x 1200) DLP models, The G60-W7 at 7,000 lumens, G60-W8 at 8,000 lumens, and the G60-W10 at 10,000 lumens, all available in either black or white to best fit their environment. With a chassis measuring approximately 19 x 8 x 21 inches (WHD), they're well suited to mid-size venues that require high brightness such as corporate boardrooms and small auditoriums, classrooms and lecture halls, houses of worship, museums, retail applications, and others. The G60s are supported by a half-dozen lens options supporting short-to-long throw installations, and they come with helpful long-range lens shift—up to 100% vertical and 30% horizontal—as well as keystone correction and the ability to support full 360 degree orientation with no restrictions. Long distance cable runs to the projectors are supported with and integrated HDBaseT connection. The laser phospher light source used in the G60 Series is rated for 20,000 hours, and contribute to a rated 100,000:1 contrast ratio (with Extreme Black processing engaged). 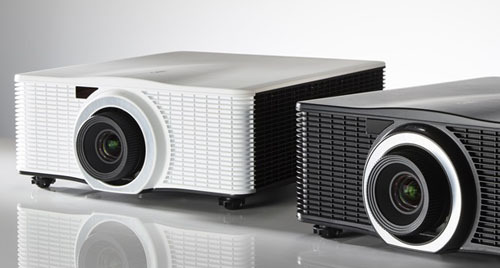 All the projectors feature Barco's Sealed DLP Core technology to keep dust away from the optics. Other features of note include support for 3D, as well as embedded warp and edge-blending via Barco's Ptoolset software. Two additional 12,000-lumen models were also added to Barco's high-resolution F80 Series of Pro A/V models, bringing the total offerings in that line to four, ranging from 7,000 to 12,000 lumens and resoutions from WQXGA (2560 x 1600) to 4K UHD (3840 x 2400). Barco's large-venue UDX series is popular among traveling entertainers and musicians who require big, bright images. Including the new ISE introductions five models total were just added to this family. The UDX-W26 and the UDX-4K26 are being offered with WUXGA and UHD 4K resolution and 25,000 and 24,000 lumens of output, respectively. Meanwhile, the UDX-4K40, UDX-W40, and UDX-U40 are in WQXGA, WUXGA, and UXGA (1600 x 1200) resolutions, and boast 35,500, 39,000, and 38,000 lumens, respectively. 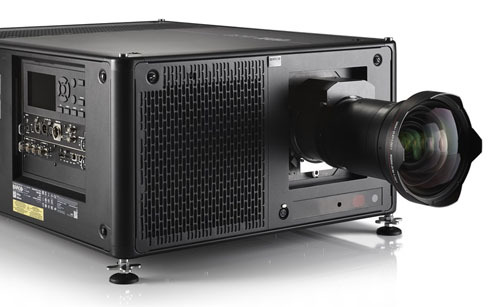 The UDX-4K40 is now said to be the smallest DLP projector in the 30,000-40,000 lumen range as well as the brightest laser projector to weigh in under 200 pounds.